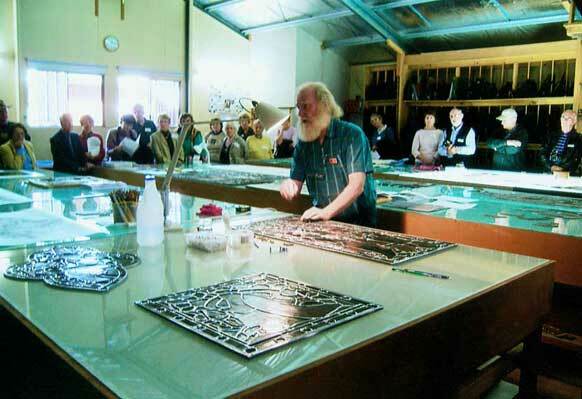 Above all, restoration is about securing the fidelity and longevity of Australia’s magnificent national and international stained glass heritage. 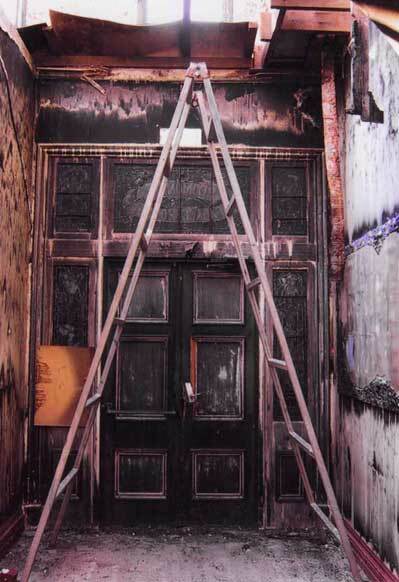 The tragic scene of the Childers Backpackers’ hostel fire, which astonishingly, the front door surround survived. Looking through the missing windows behind the altar after cyclone “Larry”. 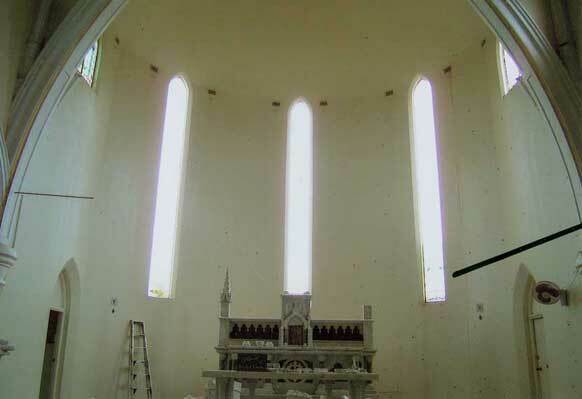 Looking through a missing chancel window and down to damaged clerestory windows after cyclone “Larry”. 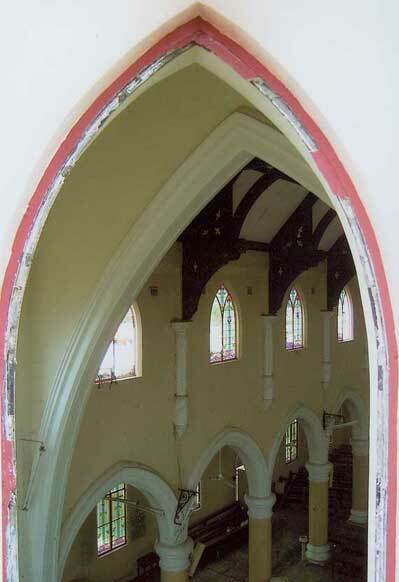 Another view through a missing chancel window and out through missing clerestory windows after cyclone “Larry”. 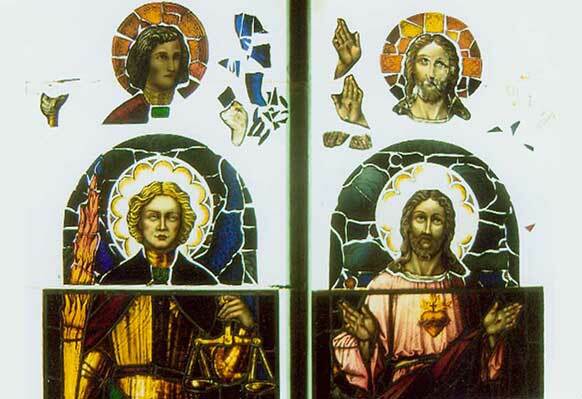 Panels recovered from area around the church after the cyclone. 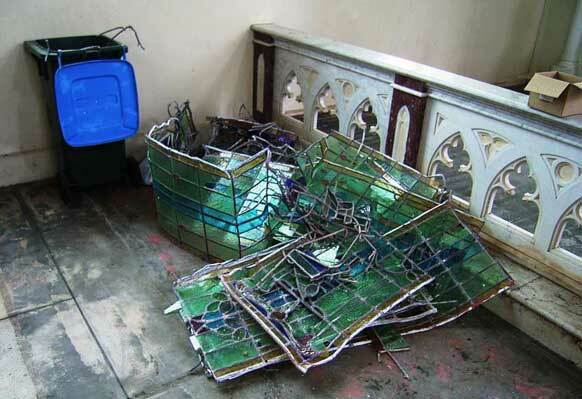 Big or small, all pieces of broken glass should be kept as they may be priceless. Hail and vandalism end up with the same result. 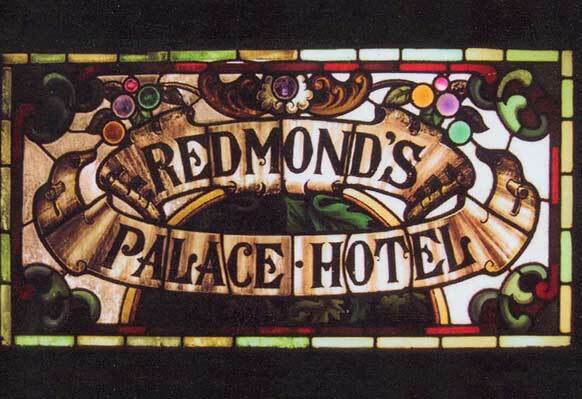 The glass piece needs to be repainted. Windows wear out. Because they are remarkably maintenance free it comes as a surprise when custodians realise that 100 year old leads have fatigued, the water-proofing putty has washed out, and the window needs removal, restoration and reinstallation. 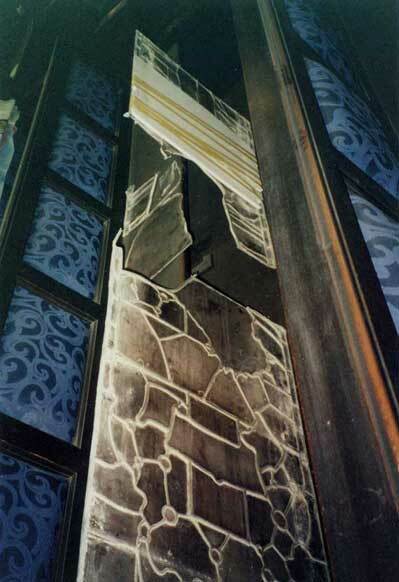 A window which disintegrated during removal and where the nearest pew became the hospital ward. Note emergency on-site Styrofoam splint supporting part of the window. Astonishing though it may be, our experience is that far more windows have been, and are being, destroyed by deleterious and ruinous previous restorations than all other combined causes. 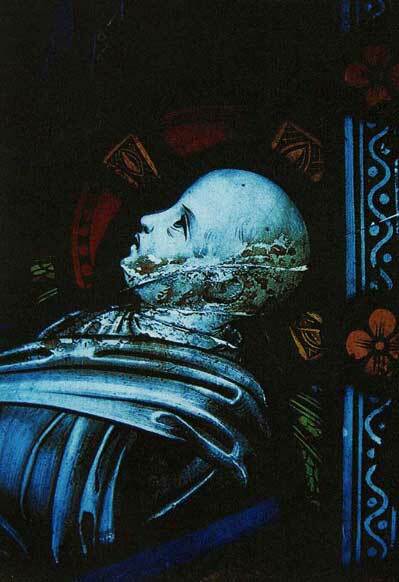 Note extensive glass paint breakdown on this face probably caused by caustic soda cleaning. All restoration begins with an on-site inspection and resultant Condition Report, irrespective of the age of the window. 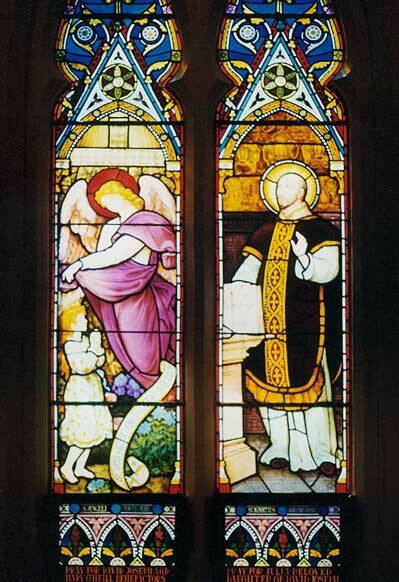 1868 John Hardman (U.K.) Studio chancel window from St Mary’s Cathedral, Hobart, restored by Cummins and Stehn in collaboration with Gavin Merrington of Hobart in 2004/05. 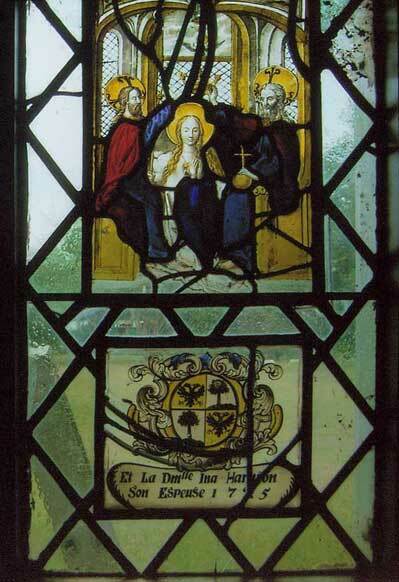 Early 16th century Flemish window currently under restoration. 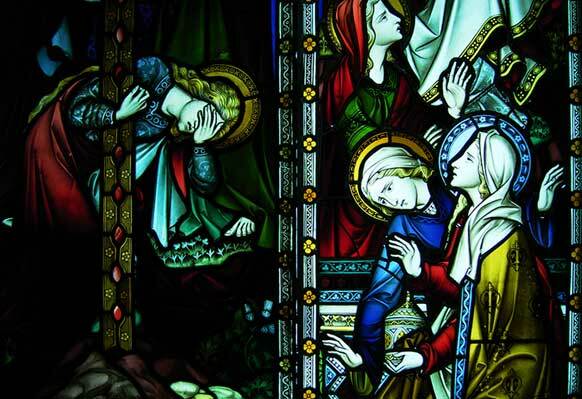 Exquisitely painted “Coronation of the Virgin” window dated 1526 currently under restoration. The condition of the glass paint is all. 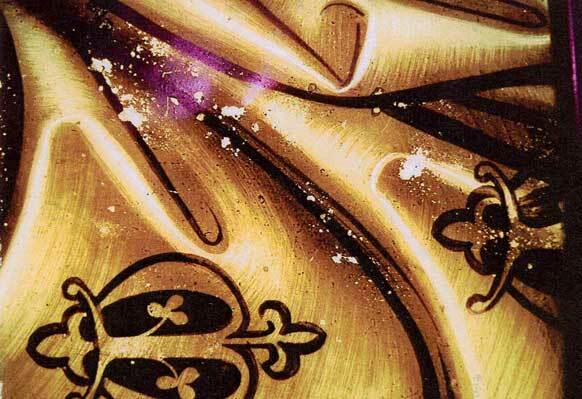 This shows glass paint being inspected on site under magnification. The field notes from which the Condition Report will be made. Sample pages from Condition Reports, which sometimes comprise forty pages of text and several hundred annotated photographs. 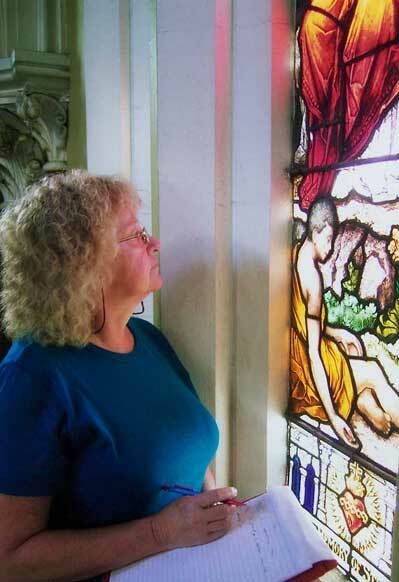 The Condition Reports and Restoration Reports we write are not the minimum required to persuade a custodian to give the restoration job to us, but to tell future generations everything we see about a window now and how we restored it. This information will be useful in a century or more when the windows needs restoring again. What we find is astonishing. 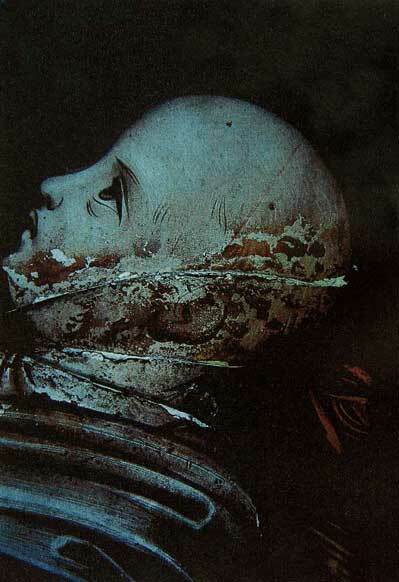 Here a 130 year old head has been fractured by stone(?) impact with resultant paint damage. 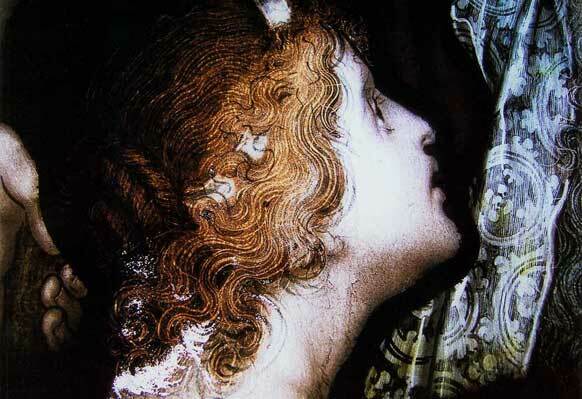 Close-up of the damaged head from the panel above. A superbly painted Mayer (Germany) Studio face. The Condition Report established glass paint breakdown in the hair at the neck, blue enamel glass paint loss in the hair band, prodigious water leakage through failed putties, and accumulated dirt embedded in the glass paint. Another face from the Mayer panel above. 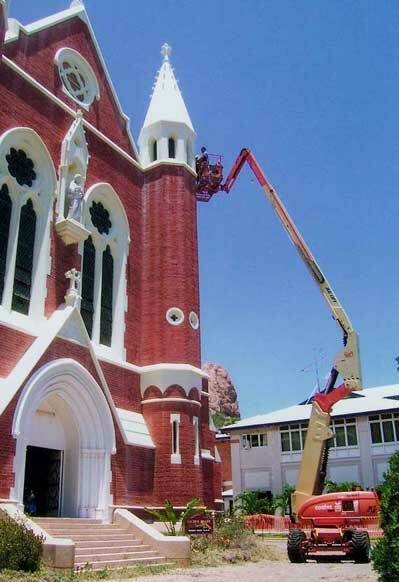 REMOVAL of windows can take one to dizzying heights. In-studio documentation consists of a constant written and photographic record of what is discovered and the techniques used. 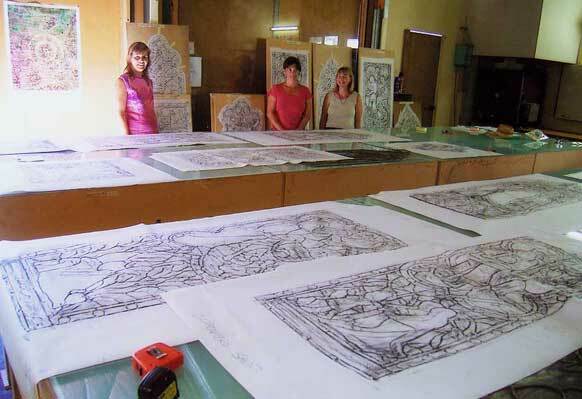 Rubbings of removed panels done on 500 year acid free paper, upon which is annotated all aspects of the existing work, including paint loss, previous repairs, original studio mistakes, etc. 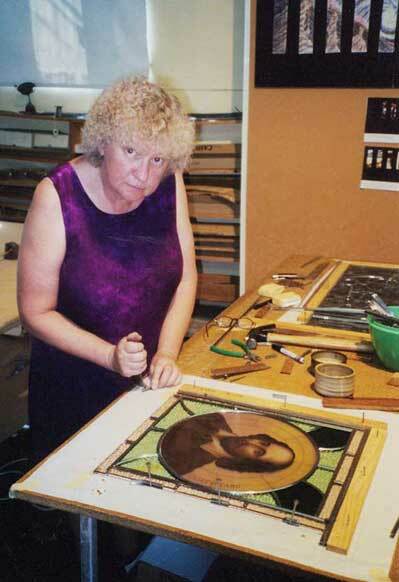 The early 16th century Flemish “God the Father” window being dismantled. 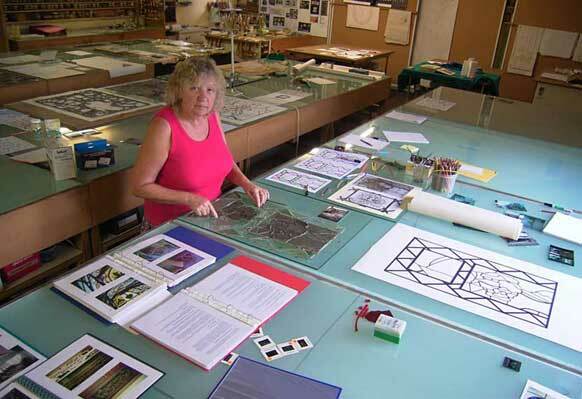 Dismantling is not just pulling the window apart, it requires constant attention and the ability to discern and the results noted on the prolific documentation. As a result of this discernment and documentation the pattern of the window’s history emerges. The image on the left records the leads, including repairing leads, which accumulated on the window during its 500 year history. 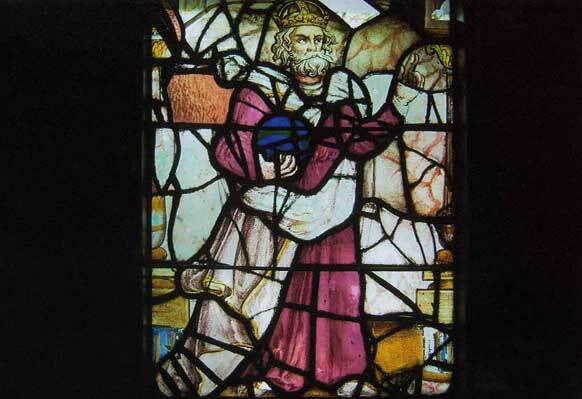 The image on the right shows the leading system as it would have been when the window was first made 500 years ago. 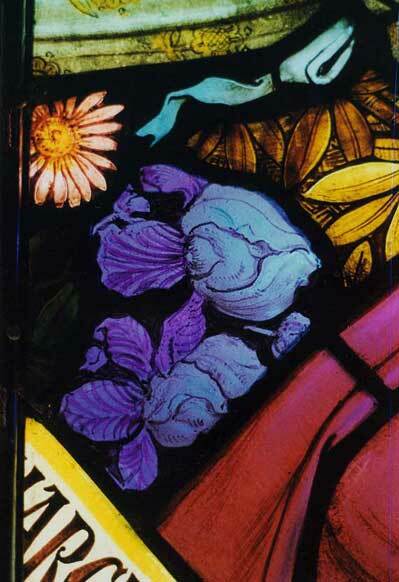 The more dirt there is on the painted surface of a stained glass window the more dirt and moisture it collects. 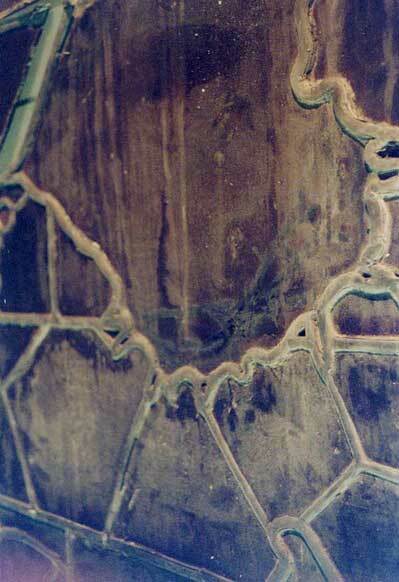 The inner surface of a portrait of Christ viewed in reflected light showing where rain water has streamed down the inner painted surface through leaking putties and the resultant embedded dirt. 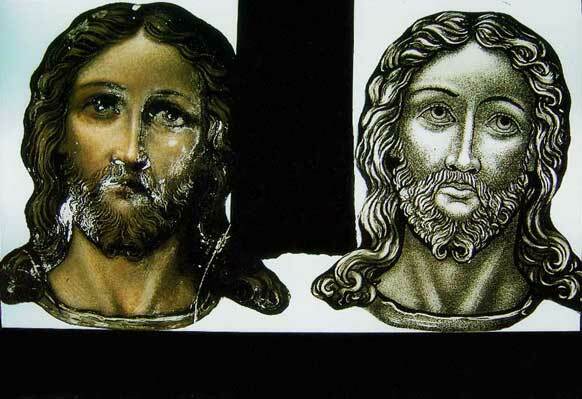 A preliminary conservation grade cleaning of a panel seen in reflected light. The closer half of the panel has been cleaned. 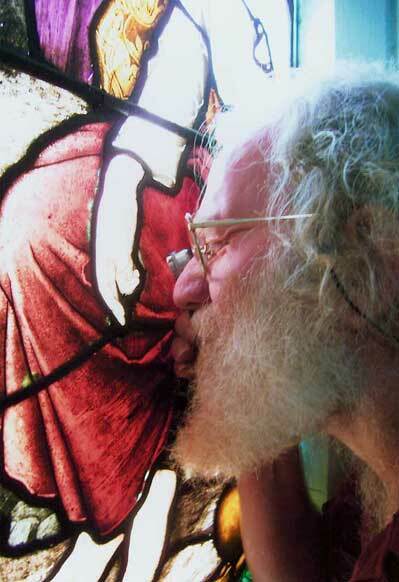 Carefully cleaning the surface dirt off the glass exposes the condition of the underlying paintwork. 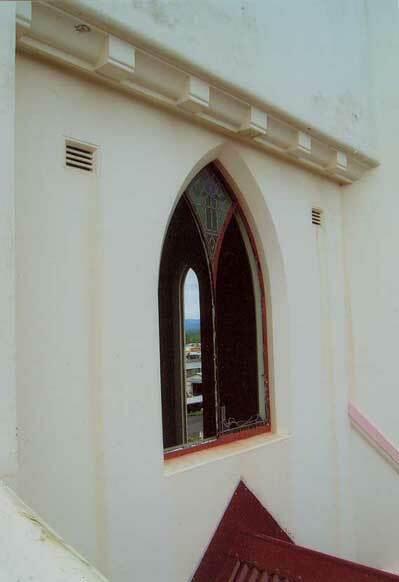 Embedded soot and smoke damage to the right transom panel (right of photograph), compared with the cleaned left panel (left of photograph) from the Childers backpackers’ hostel. Another fire damaged panel half cleaned and half still sooty. The same image as above when held up to the light. 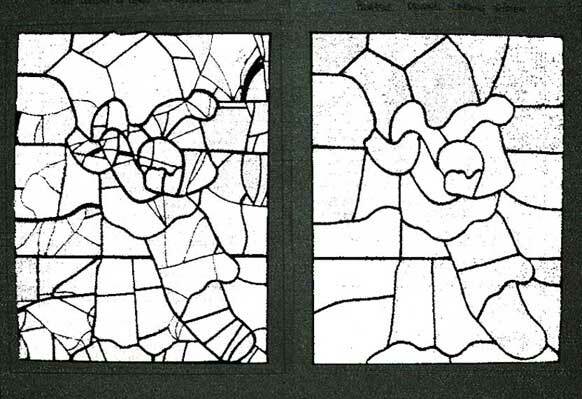 Two John Hardman (U.K.) Studio panels from the same window laid side by side in transmitted light. The right panel has been cleaned but the left has not. Comparison of the borders is revealing. 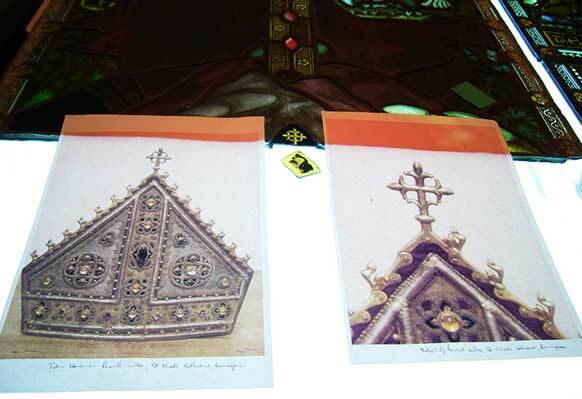 The mustard garment of the bottom right figure is the same colour glass as the dirt obscured mustard of the base of the cross in the left. Keen observers will notice the differences in the borders, all of which are original but seem to have come from different parts of the Hardman studio. Enthusiastic over-cleaning of glass paints can be more deleterious than none. 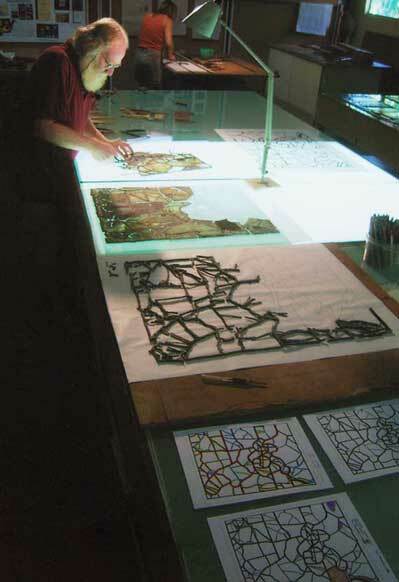 An area of a restored window where the large pieces of glass have not been correctly fired in the kiln of the original studio. 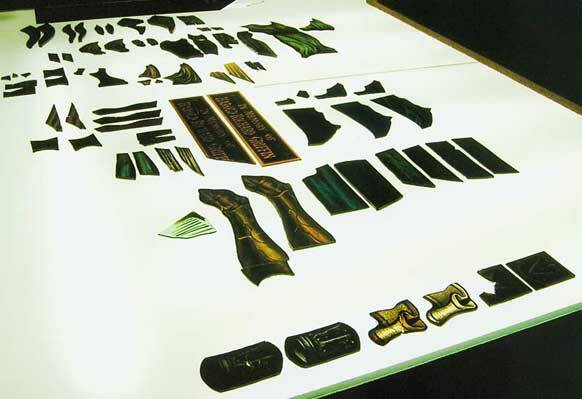 This has left the surface of the glass paint on the large pieces of glass semi-matt, while the small pieces have been fully fired to a correct glass. Trying to clean underfired glass paints is an agonisingly slow and difficult process. 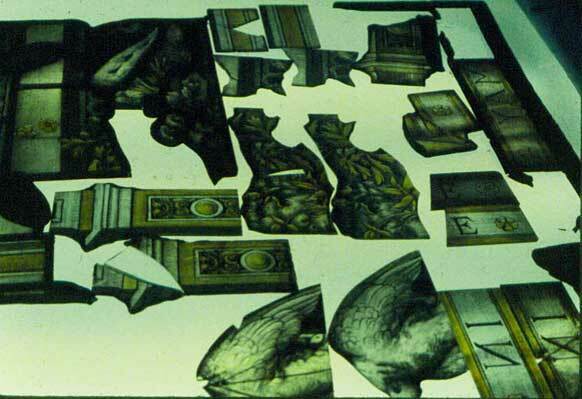 When glass pieces have shattered, are missing or have been ruined by previous deleterious restoration, there is no option but to repaint the glass using the same colour and types of glass, the same kiln firing glass paints, stains and enamels, and identical techniques. 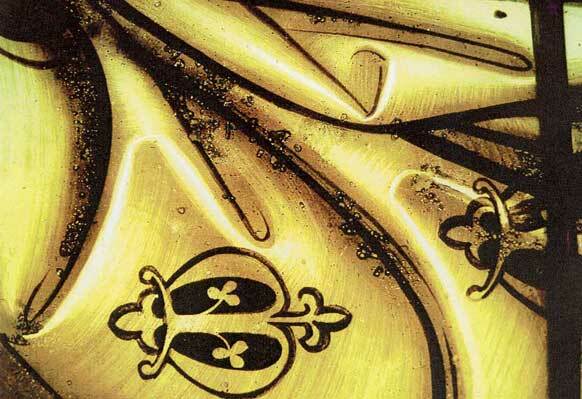 During a recent tour by Ausglass members, nobody was able to identify the repainted pieces. Repainting after hail stone damage. Repainted face reconstructed from the few remaining fragments of the original. 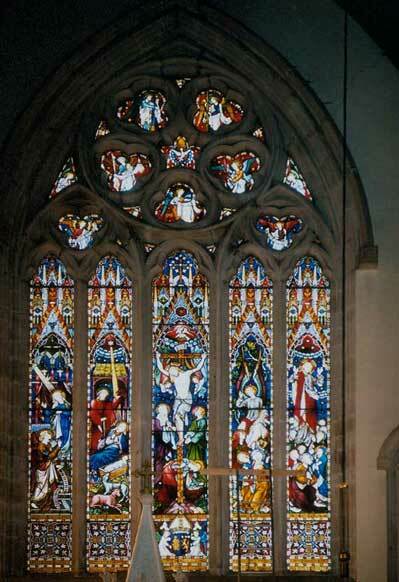 The restored window in which there are over twenty pieces of replaced repainted glass. Attention to detail and research is important. A repainted cross. The previous replacement was done with black “Dulux” which had worn off. Just what the cross should look like was provided by the Diocesan Heritage Officer. Assistance from historians and archivists is indispensable. 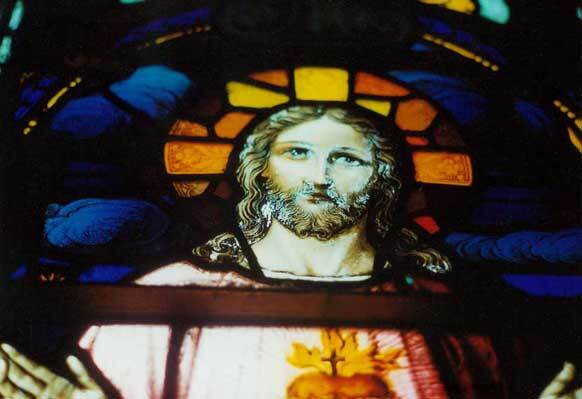 The original face is on the left and the glass paint has fallen off due to previous deleterious restoration practices. Gerry is in the process of painting a new face shown on the right. Detail. The repainted piece has three layers of glass paint already applied and still needs three more – flesh tone, the hair colour and the “blush” on the cheeks and lips that give F.X. Zettler (German) Studio’s portraits their distinctive “look”. 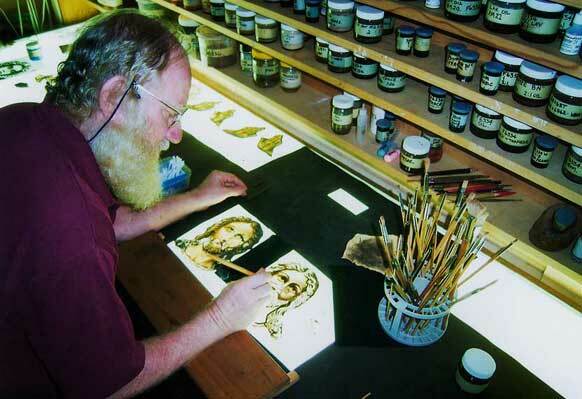 The repainted piece on the light box of both the “Sacred Heart” portrait and the companion “St Michael”. 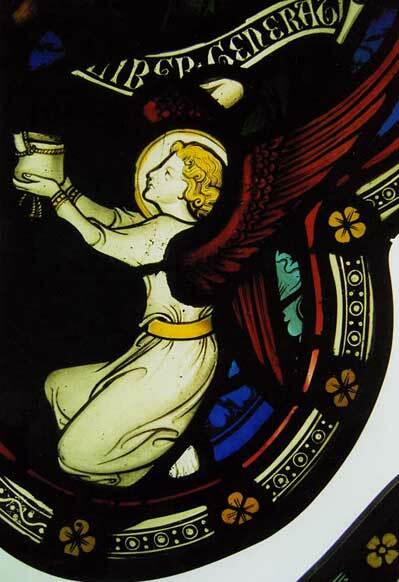 It was decided in conjunction with the custodians that the previous replacement head for “St Michael” should itself be replaced by a more accurate depiction of an F.X. 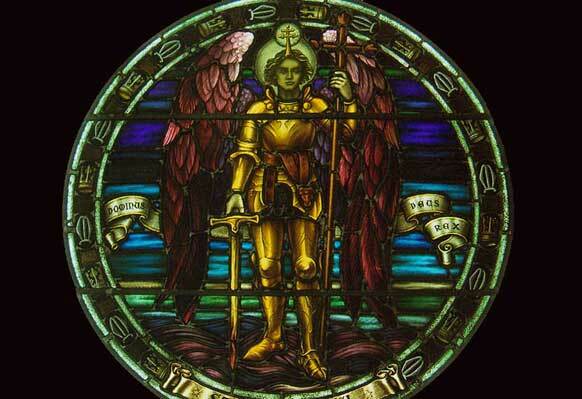 Zettler “St Michael” head, sourced from Dunedin in New Zealand. The garish 1960s replacement halos were also replaced with researched F.X. 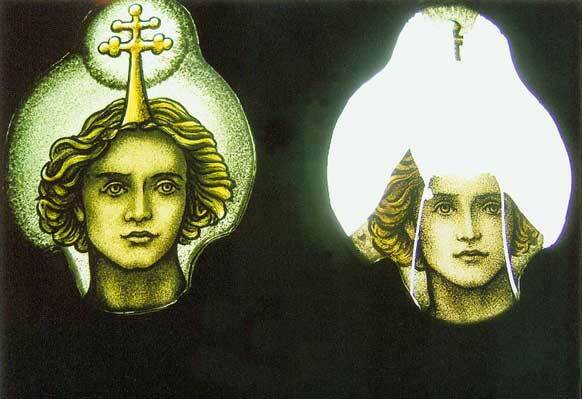 Zettler type halos. 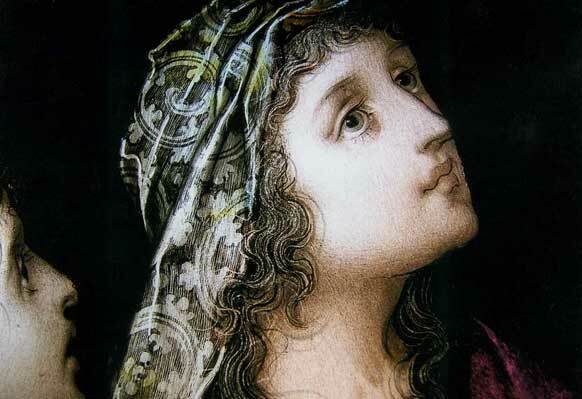 Even when glass paint breakdown caused by age or previous ruinous restoration practices have totally destroyed the glass paints and enamels, it may not be necessary to replace all the original glass. 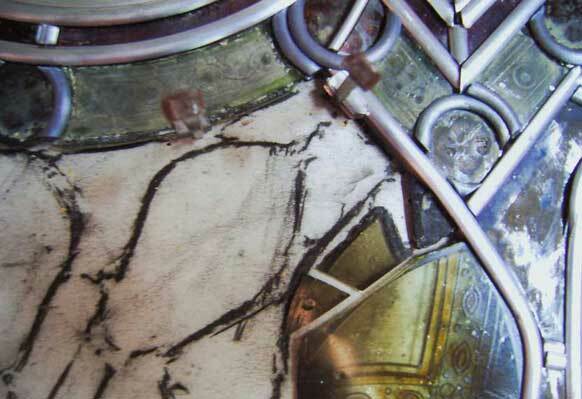 This details shows where a piece of clear glass has had painted on it the tracelines, shading and enamels “lost” by restoration, which will then be replaced in the same lead (plated) on top of the original glass and stain, thereby preserving at least some of the original material whilst reinstating what the original piece looked like. 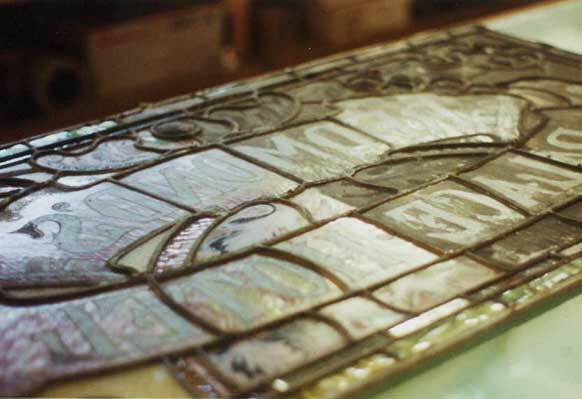 One of the marvels of modern conservation and restoration is the use of conservation grade epoxy resins which can be used to edge glue back together shattered pieces of glass. 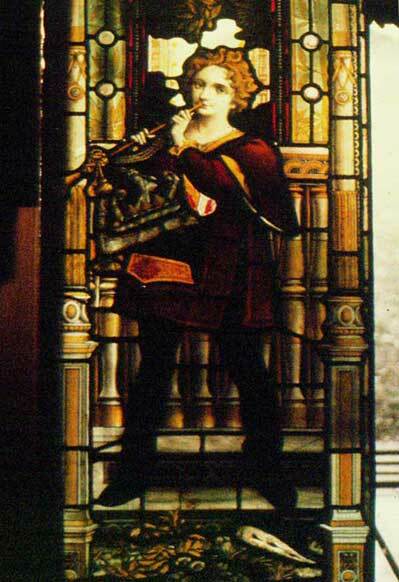 Whilst this technique is less than perfect, the alternatives are to either repaint the piece and keep the fragments or use unsightly mending leads which mar the original integrity of the window. Edge glued star fracture. 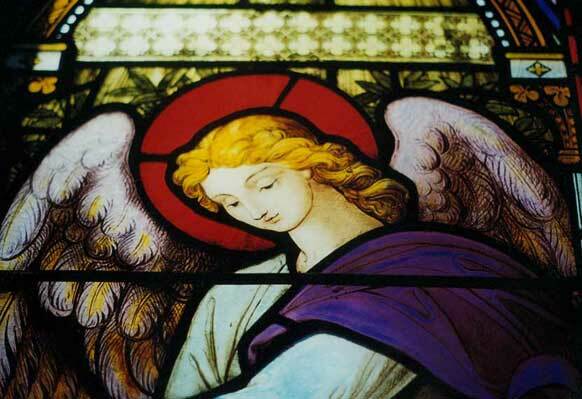 The point of impact can be seen in the angel’s left shoulder. Surrounded by supporting documentation, Jill Stehn examines a 1526 and 1725 panel to see if shattered pieces can successfully be edge glued back together again. This raises the delicious prospect of returning the panel to the custodian with pieces edge glued back together that may have been broken hundreds of years ago. 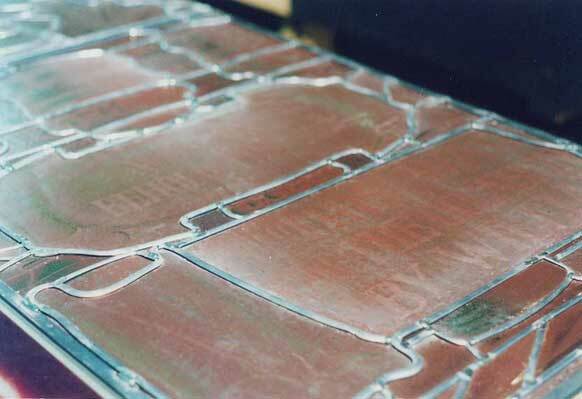 Releading panels more successfully and with better quality leads is a great pleasure. An extremely complex piece of releading. To gain access to the myriad of tiny pieces, this area is leaded separately and then expertly slipped into its position in the matrix of the window. 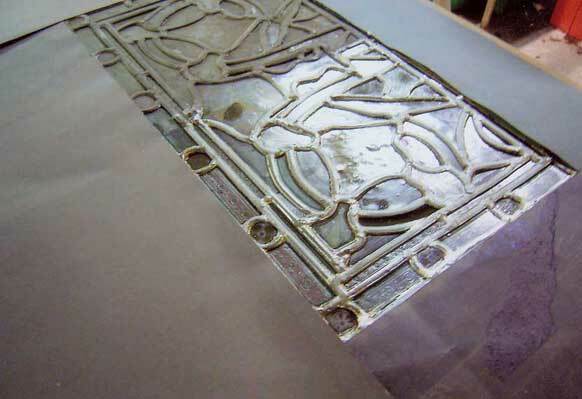 Restoration of windows requires constant attention and skill, including during the releading stage. There was an ugly spall on the edge of this superb portrait which may have endangered it. Special leading techniques were employed to ensure that no pressure was put on the spall. 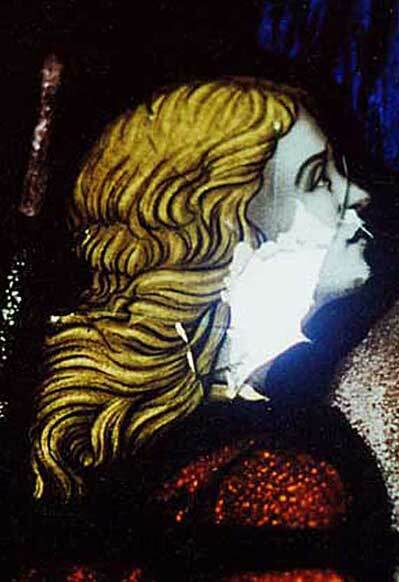 In this example, the glass paint has disintegrated, leaving distracting pinholes of light. 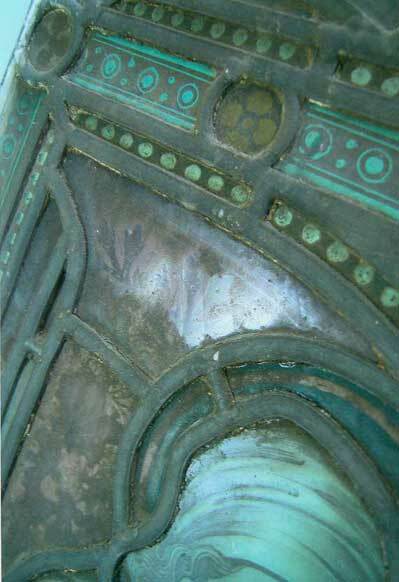 This shows the same area after the lost glass paint has been reinstated using reversible cold (i.e. 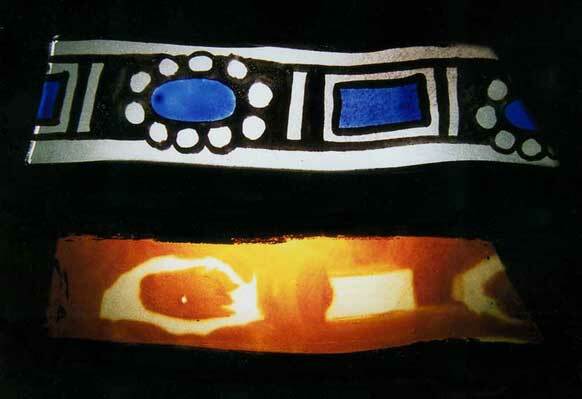 not kiln fired) enamels. Reinstallation can be a substantial undertaking. 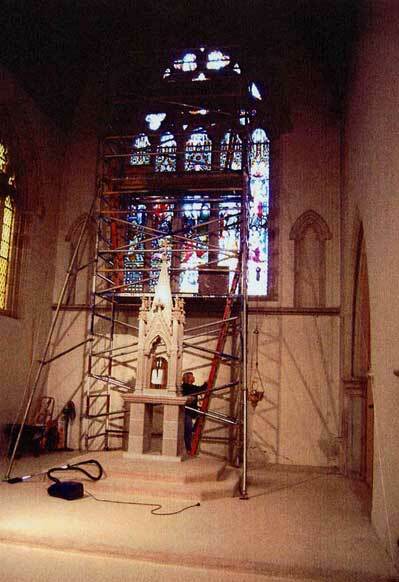 Reinstalling the John Hardman (U.K.) Studio window at St Mary’s Cathedral, Hobart, took four people almost two weeks, including the installation of glass protectors. The St Mary’s Cathedral, Hobart, restoration was done in a temporary studio in Hobart to save costs. Talks were given to the parish and the public twice a week. 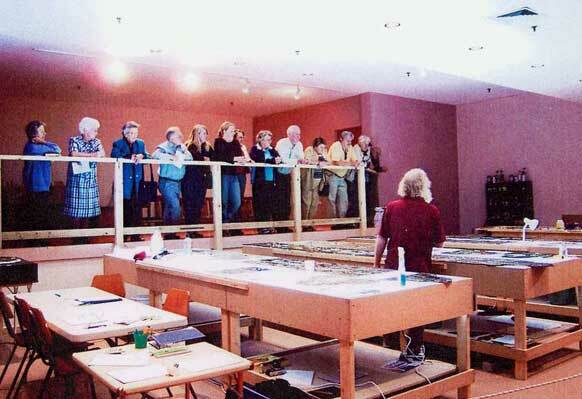 A group of visitors on tour in the Cummins and Stehn Studio. 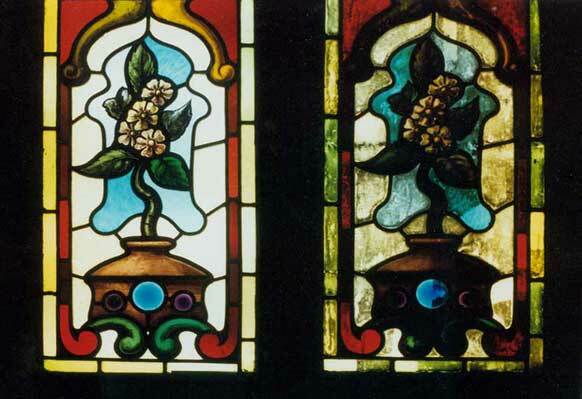 The joy of restoration is in knowing that a restored window will last at least another century before requiring its next restoration. It is also deeply satisfying that our studio has the knowledge and skill to return the glass paints to their best possible condition. 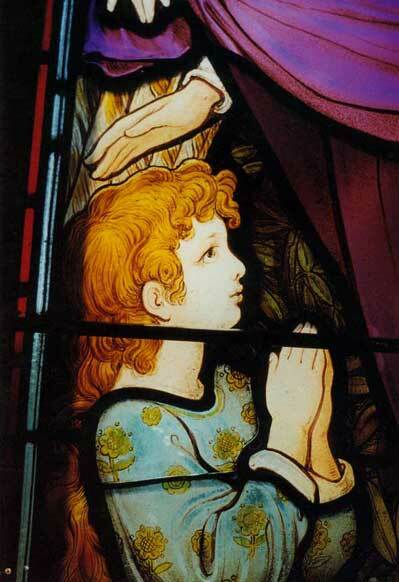 A detail from a Lyon & Cottier Studio (Sydney) window which has a superb flashed gold based pink garment, virtuoso painting and a beautiful deep auburn orange stain in the child’s hair. Detail from the window above. Another detail from the window above.